The brilliance of good fruit liqueurs is that they’re available to us in all seasons. We often use fruit liqueurs and spirits that correspond with the season: Berry liqueur in summer, apple brandy in the fall. The Spiced Pear Liqueur is genuinely juicy, with a vivid, ripe pear flavor, against a backdrop of cinnamon and clove. It’s rich and luscious on the tongue, and takes well to every spirit we can think of — from light spirits like vodka and gin, to long-aged rums and Cognacs. Have we gushed enough? This stuff is delicious. Here are three original cocktails to try it in. A classic pre-dinner drink in the Cognac-producing regions of France is a simple highball: Cognac and tonic. We love how the rich French brandy melds with the lively tonic, and the spiced pear liqueur slides right in, with a little lemon and soda to cut the sweetness. Almost criminally easy to drink. Instructions: In a cocktail shaker with ice, combine an ounce of Cognac (we love H by Hine), an ounce of spiced pear liqueur, half an ounce of fresh lemon juice, and half an ounce of simple syrup. Shake until very well-chilled, and strain into a tall glass with fresh ice. 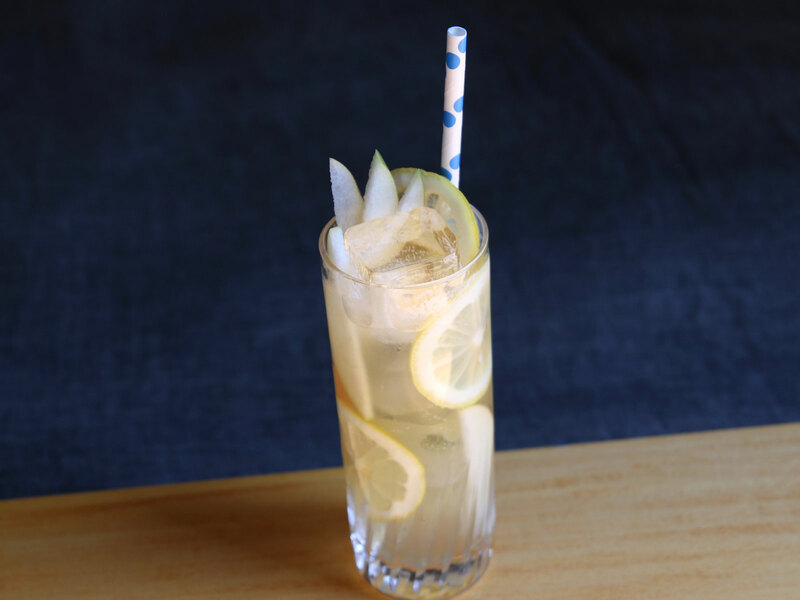 Top with an ounce of soda and an ounce of tonic, stir briefly, and garnish with some lemon wheels and a few fanned-out pear slivers. This drink definitely calls for a straw. Not quite a margarita, but sure to appeal to margarita fans. We’re using reposado tequila, which spends a little time in the barrel, along with the spiced pear liqueur and a little citrus. We’d never thought to pair tequila and pear before, but goes to show you — this stuff goes with everything. Instructions: In a cocktail shaker with ice, combine an ounce and a half of reposado tequila, an ounce of spiced pear liqueur, 3/4 ounce of fresh lemon juice, and 3/4 ounce of agave syrup (that’s just agave nectar, cut 1:1 with hot water so it dissolves more easily). Shake until very well-chilled, and strain into a rocks glass with fresh ice. 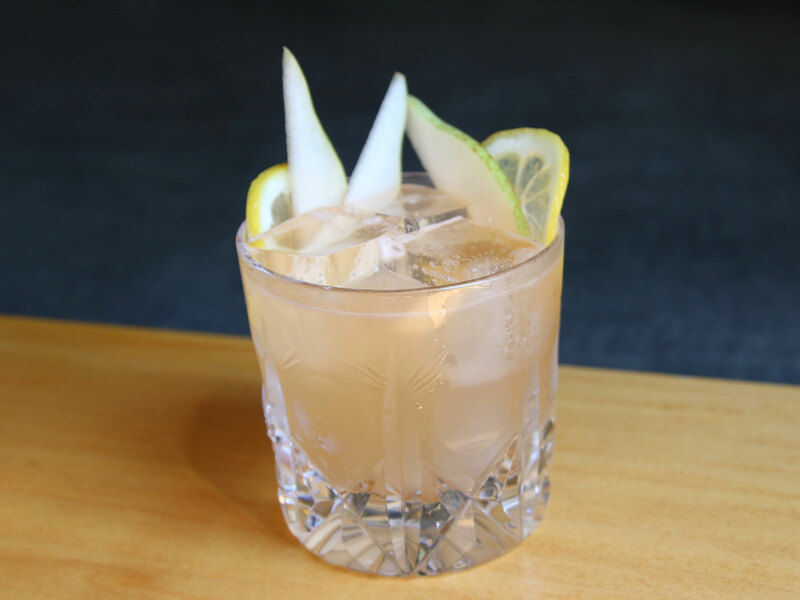 Garnish with lemon wheels and pear slivers. A perfect after-dinner drink whatever the season. Rich aged rum and rich oloroso sherry are just begging for a hint of pear and spice; that comes through the liqueur, with Angostura bitters adding more warm spice still. 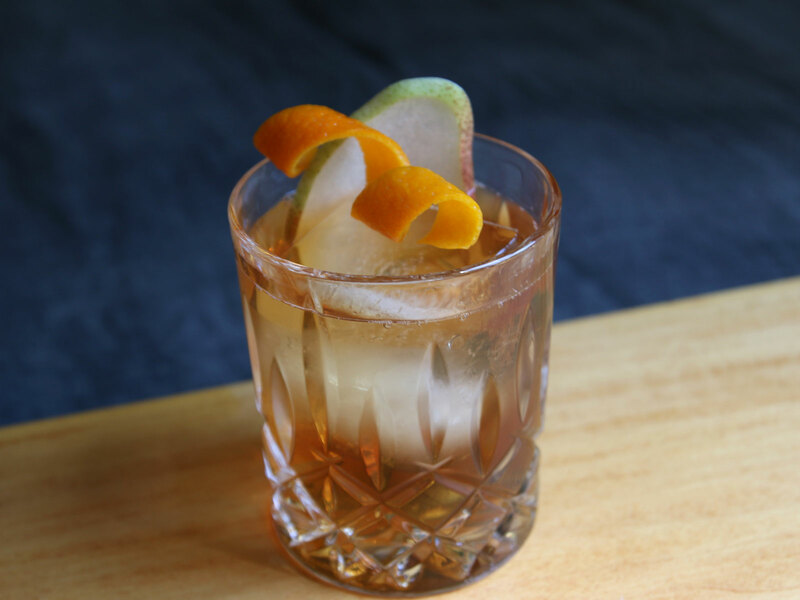 Instructions: In a mixing glass with ice, combine an ounce and a half of dark rum (we like Mount Gay Black Barrel), an ounce of Oloroso sherry, an ounce of spiced pear liqueur, a quarter-ounce of simple syrup, and a dash of Angostura bitters. Stir until very well-chilled — between 45 seconds and a minute — and then strain into a chilled martini glass or coupe. Garnish with an orange twist, spritzed over the top to release its citrus oils, and a thin slice of pear.